Exactly like the previous guides, first setup the LCD. We will adjust the contrast with potentiometer – so that is an important thing. 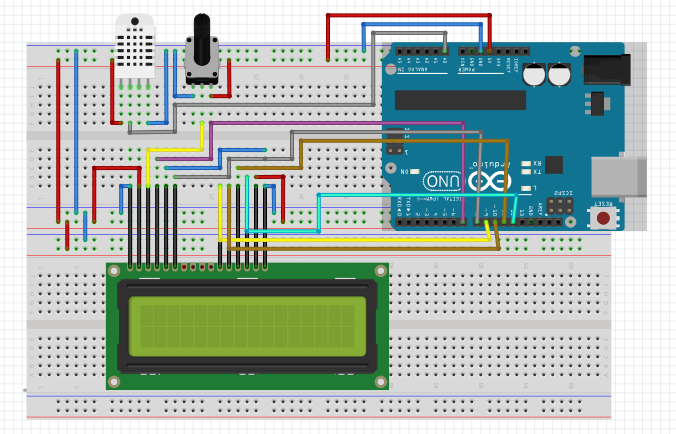 With the above connection, again connect your Arduino with computer, the LCD will light up. Adjust the potentiometer and you’ll be able to see from blank to white all units like    . That     is full contrast and blank is minimum contrast. If you use 1, 2, 3, 4 numbers of breadboard, you’ll not get confused. With the above connection again connect Arduino with computer. Next step is connecting the DHT 11 sensor. That is easy. #define DHTPIN A0 // Pin which is connected to the DHT sensor. The above is 100% working code tested on January 2018. The reason peoples face issues with DHT 11 is out of not properly using the needed libraries. From Arduino Web IDE, you’ll not need to install any libraries. What libraries to install on local computer’s Arduino IDE, that is discussed on the previous basic guides linked at the beginning of this article. This Article Has Been Shared 8538 Times! 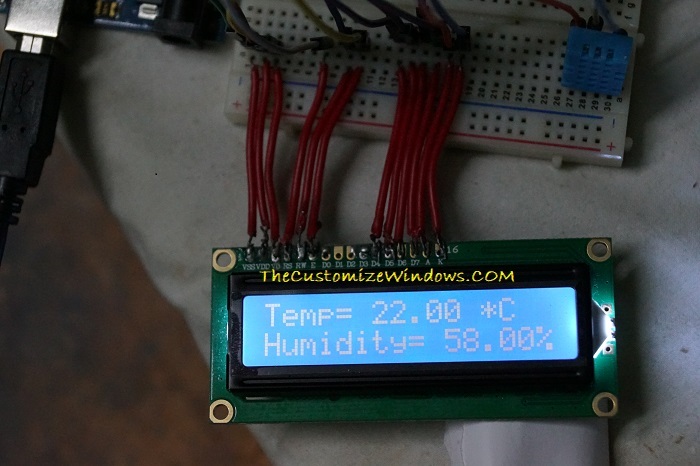 Cite this article as: Abhishek Ghosh, "Arduino Temperature & Humidity Sensor DHT 11 With LCD 1602A," in The Customize Windows, January 8, 2018, April 21, 2019, https://thecustomizewindows.com/2018/01/arduino-temperature-humidity-sensor-dht-11-lcd-1602a/.